The success of a training program does not only rely on the participation of the attendees and the program to be discussed. One of the factors that can affect the entire flow of a training is the ability of a trainer to provide all the relevant information that trainees need to be knowledgeable about. Companies spend money, time, and effort to make sure that they have qualified trainers who can provide an improvement to the operations and the workforce. Trainers also get special classes where their skills are developed to make sure that they are ready for the tasks that will be given to them. 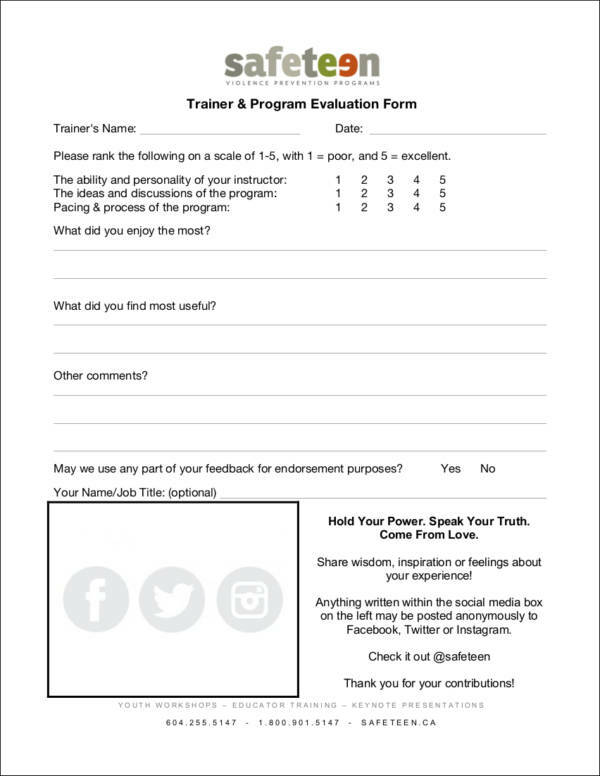 If you want to ensure that a trainer is as effective as you have expected him/her to be, then using a trainer evaluation form will most likely work to your advantage. Trainers are needed to be evaluated as their role can either improve or deteriorate the efficiency of a training program. Creating an objective trainer evaluation form can help your business be informed on whether it has made the right decision to entrust training processes to an individual. 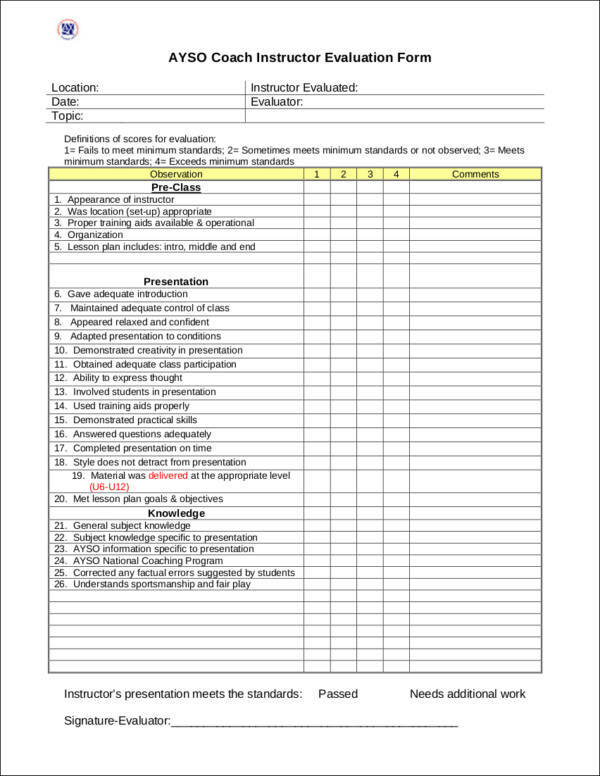 This article contains some important information regarding the creation of training evaluation forms, the definition of a trainer evaluation form, and a selection of useful samples and templates of trainer evaluation forms. You can browse our collection of various forms available on our website. 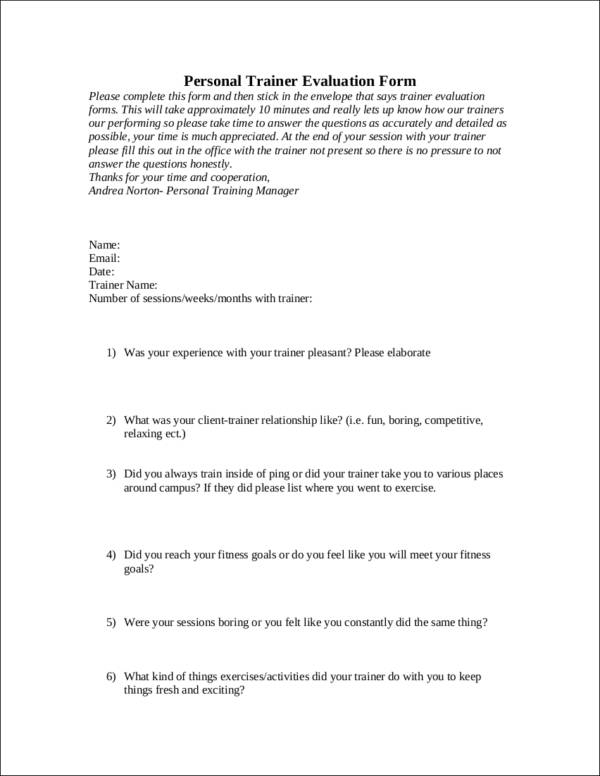 What Is in a Trainer Evaluation Form? Some trainer evaluation form will require attendees to specify their names while there are also some that respect the anonymity of the respondents. 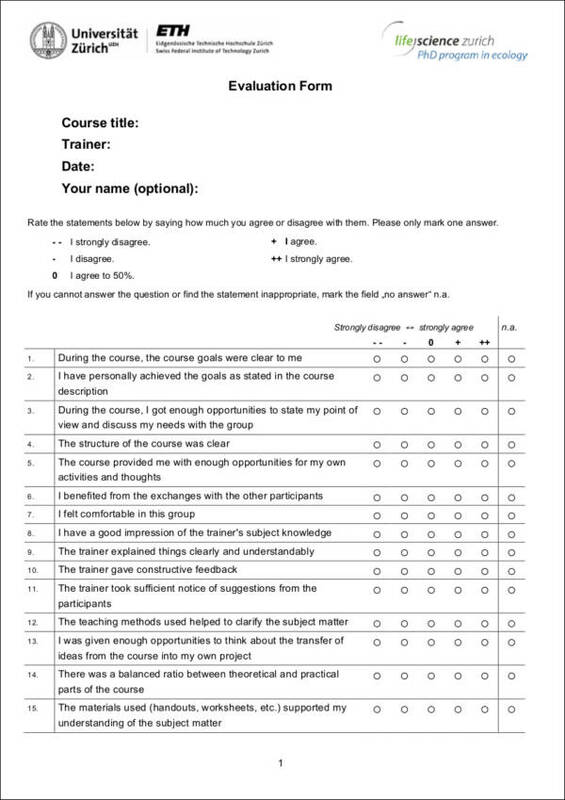 Trainer evaluation forms should have the information listed above for it to be comprehensive and highly usable. Give focus on the knowledge of the trainer about the discussion. Your trainer should have a full grip of what he/she is talking about. It is very important for a trainer to be believable and credible. He/she needs to have a full understanding on what he/she is sharing for the training program to be successful. Do not forget to assess the ability of the trainer to master the content of the training. Consider the confidence and communication skills of the trainer. Aside from being fully aware of what he/she is discussing, a trainer also needs to make sure that proper communication is being practiced. Attendees need to feel that they are a part of a process and that their participation is very important and highly regarded. For a trainer to be able to do this, he/she needs to be confident in talking to the program attendees. As a business, you need to make sure that you will have a criterion that can set a particular trainer from the other trainers when it comes to making a platform for open communication. Keep in mind that the presentation skills of the trainer matter. Training materials and visual aids can help a training be more interesting. However, it is the presentation skills of the trainer that can make a big difference. When making the criteria for evaluation, do not forget to identify the ability of the trainer to present various topics. Measure the impact of the trainer to the trainees. For your evaluation to be relevant, you need to make sure that you can sum up the experience of the trainees. They are the ones who will benefit from the training the most, which is why you need to get their opinion on whether they have learned from the trainer or not. Identify the learning environment that the trainer has created. The learning environment that a trainer creates can affect the way trainees look at the subject matter. Trainers should not be intimidating so that trainees will be comfortable to immerse themselves on the discussion. If you want to assess a trainer with regards to this matter, make sure that you will include this in the form that you will let the attendees answer after the training program. How Can a Trainer Be Evaluated? The ambiance of the location where the trainer will provide training. Though some training rooms are already predetermined, a trainer needs to ensure that the space where learning will occur will be fully maximized and utilized. The management skills of the trainer when it comes to ensuring that all the attendees are focused on the discussion. A great trainer should not focus on one of the trainees. He/she should be able to get the attention of all the training attendees. The ability to manage a big group is one of the strengths that a trainer should have. The ability of the trainer to provide necessary instruction especially in relation to special activities. All the instructions during the training duration should be given accordingly. Trainers have the responsibility to make sure that the attendees of the training are fully aware and guided on what to do and how to do particular activities. The ability of the trainer to prepare accordingly for the training to smoothly flow. A trainer may have prior training experience but it is his/her preparedness that can make the training successful. Trainers need to prepare not only themselves but also all the things and materials that will be used for the training. If there is a continuous flow of activities, then time will be consumed in a more productive manner. The skills of the trainer relevant for presentation and usage of training materials. Not everyone can be a trainer as there are some specific skills that the job requires. Trainers need to be able to present with confidence so they can ensure the attendees that they are getting something and are benefiting from the training. The response of the attendees and other stakeholders about the overall training. Trainers should not only be evaluated by the trainees. The management of the business should also have a say on whether the trainer is a good middle man when it comes to supplying the needs of both the trainees and the business. The modulation and proper usage of the trainer’s voice. Especially in big groups, the tone and modulation of the trainer’s voice is very important. The way that a trainer speaks can affect the interest of the attendees. More so, proper loudness and voice usage can ensure that all the attendees can hear what the trainer is talking about. The ability of the trainer to achieve the objective of the training. The trainer should be fully aware of why the training has to be done. This will make him/her knowledgeable on how to conduct the training accordingly. At the end of the day, a trainer needs to provide the deliverable so that the training will help improve the functions of the attendees. The time management of the trainer that will reflect on the effective coverage of all the topics that are needed to be discussed during the training. Most training programs only have a limited time. This is the reason why trainers need to use their time for discussion effectively. Trainers should not go too fast or slow so that the attendees can have the best training experience. The participation of the trainees within the entirety of the training program. You can see that a trainer is effective if the trainees are showing interest to the discussion. Trainers need to make sure that all the trainees are participating in the program and each of them has their takeaways, which they can use for improvement and development. The knowledge area of the trainer about the topic/subject. It is of most importance for a trainer to be evaluated based on how familiar he/she is to what is being discussed during the training. Direct and relevant experiences, as well as advanced learning, can make a trainer succeed in terms of identifying the different areas of the topic being talked about. Always let the trainer know the results of the evaluation. 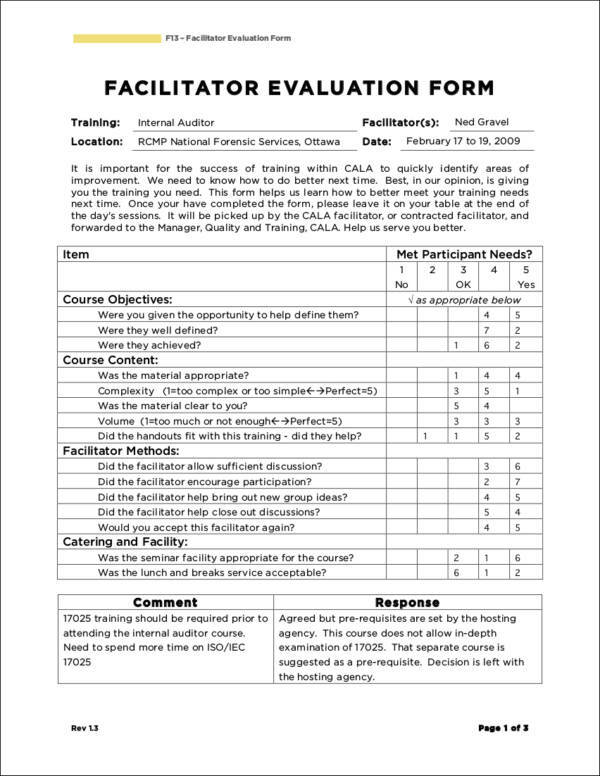 A trainer evaluation form can present the performance of the trainer based on other’s perception. This way, the trainer will know the areas where he/she needs to improve and those that he/she needs to maintain. Make sure that the evaluation is following a method and process of assessing information. Metrics are created for this particular purpose. 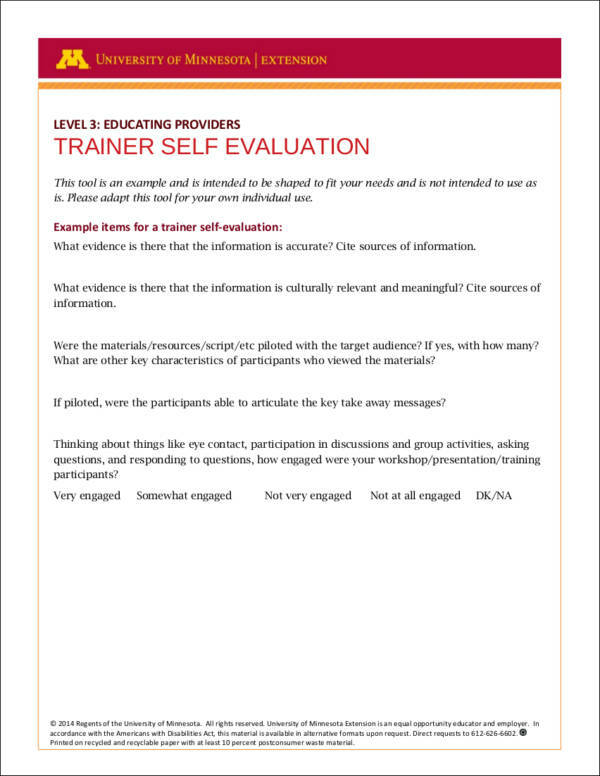 The gathering and collation of data can directly impact the effectiveness of using a trainer evaluation form. Be direct to the point when asking questions. You need to make sure that the attendees of the evaluation can understand what you would like to get from them. Provide precise and direct to the point questions that can easily be answered by the people who have attended the training. 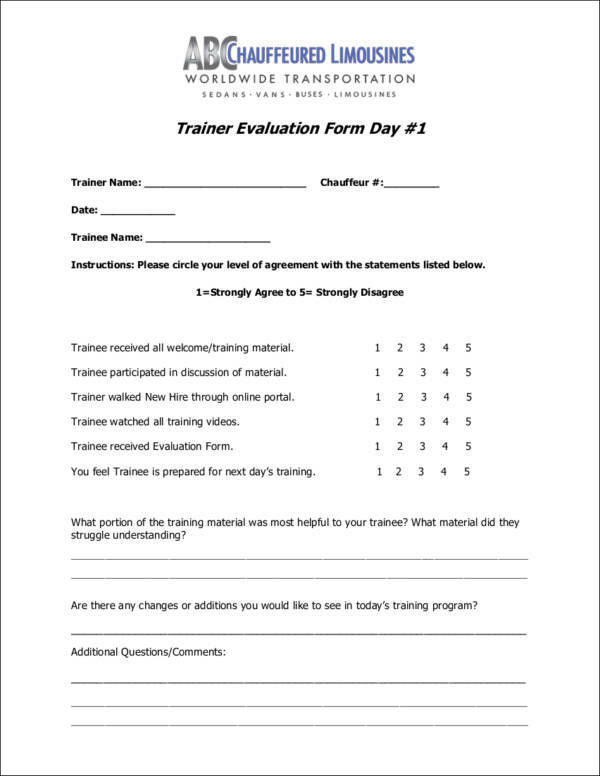 Using a trainer evaluation form can help a lot as it can provide development to the training program, the management, and the trainer. This, in turn, can improve the experience of the attendees of future training programs. This tool and the process of its usage can be beneficial to a lot of stakeholders, which is why its curation should be well-thought-of and properly planned. If you want to identify the results of your trainer’s performance, then create a trainer evaluation form for your advantage. Furthermore, you can download the evaluation forms available on our website should you need to create and format a specific type of evaluation form. Some of the evaluation forms that you will find on this page include a product evaluation form, retreat evaluation form, and an employee performance evaluation form.